Welcome to Ashland Men's Ministry! The Ashland Men’s Ministry, believing that all Christian men are one body in Christ (Rom. 12:5) but are under the spiritual authority of the local church where they attend (Heb. 13:17), seeks to . . .
Unify Christian men in those areas of faith and practice in which we agree. Encourage men’s Bible studies to help in their Christian walk and maturity. Encourage regular church attendance, and service, in and through their local churches. 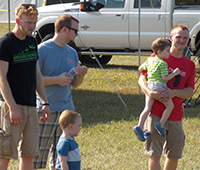 Provide for Christian men’s outreach and faith-oriented events and activities. Assist churches to provide Christian events that would be difficult for one church to sponsor.